Heat up some cocoa and grab a candy cane ’cause this week we’re reading about Christmas Eve and Christmas Day in 1941. Specifically, we’re reading Chaptes 4-6 in Stanley Weintraub’s Pearl Harbor Christmas. Since the chapters are titled instead of numbered, it’s chapters labelled December 23, 1941; December 24, 1941, Christmas Eve; December 25, 1941, Christmas Day. No worries if you’re not doing the full read-along, ’cause we have the historical summary, a few quotes, and some holiday inspiration here in this blog post. The Japanese fleet that had taken the strike force to Pearl Harbor docked in Hiroshima Bay. Hints emerged that Japan and Germany might not be the friendliest partners in the Axis Powers; both wanted supplies from the other nation and weren’t always polite about the demands. Hitler gave in and broadcast a message asking the German people to donate winter clothing to support the military; this marked the first time he publicly admitted he could not properly supply his army and not all was well logistically or militarily. In the morning, the first official meeting to discuss war strategy began after late breakfasts. They agreed that all Allies should support each other and not make peace without the agreement of the other Allies; this would avoid the chance of separate treaties and secret negotiations. In the afternoon, the discussions continued with the Americans and British theorizing what areas could be held and where to open offensives; the offensive plans centered in the European or African theaters with hopes to hold defensively in the Pacific. Roosevelt and Churchill participated in a press conference. Meanwhile, air raid drills caused havoc and looting in some parts of the United States; in Washington D.C., the staff at the Library of Congress prepared to store and ship important governmental and historic documents to safety at Fort Knox. 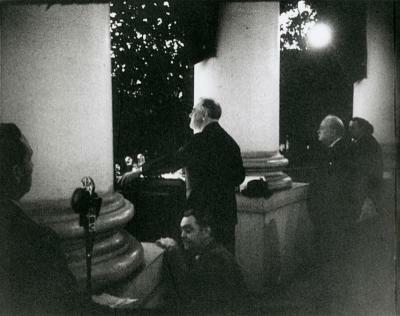 Roosevelt speaking at the Christmas tree lighting ceremony while Churchill waits for his turn to speak. In the Philippines, Douglas MacArthur and his family left Manila for Corregidor. Sailors at sea on civilian vessels tried to celebrate the holiday, usually with songs, better food, and alcoholic beverages. Gifts for President Roosevelt and Prime Minister Churchill arrived at the White House and embassy. Both Roosevelt and Churchill had their staff set up separate map rooms where they could ponder the situation and track developments that were continually reported from the fighting fronts. In the conferences, the participants discussed an invasion of North Africa, getting more American supplies and some troops to Britain, how long the British could hold Singapore, and what was really happening in the Philippines. Outside the White House, staff and security prepared for the yearly Christmas tree lighting ceremony on the executive mansion’s lawn. In the evening, both Roosevelt and Church spoke at the tree lighting which was also radio broadcast (see quotes two and three below), then enjoyed a Christmas Eve dinner at the White House. Some American soldiers still held positions on Midway and Wake Islands in the Pacific. The British troops in Hong Kong surrendered to the Japanese on Christmas Day. The Japanese did not celebrate Christmas, but the 25th was still a day of celebration for them; in 1941, this day marked the anniversary of Emperor Hirohito’s succession to the imperial throne fifteen years earlier. The British authorities returning from their meeting with Stalin in Moscow reached Murmansk and prepared for a frigid voyage to Scotland. Prime Minister Churchill and President and Mrs. Roosevelt attended Christmas Day services at Foundry Methodist Church. Churchill and Roosevelt spent the afternoon separately reading messages and war reports. The Americans did not want to send troops to Singapore to aid the British remaining there, fearing it would be a waste of lives and logistics. Roosevelt continued proposing a “Europe first, Pacific second” plan of action while Churchill explored options for attacks or invasions into Nazi-held Europe or the Mediterranean. On Christmas morning, Rear Admiral Chester W. Nimitz arrived at Pearl Harbor, Hawaii to take command of the Pacific Fleet. I love Scottish Terriers – “Scotty dogs” as I like to call them. No, I don’t have a dog and I don’t want a dog right now, but I like these little pups and incorporate their images in my Christmas decor or apparel. 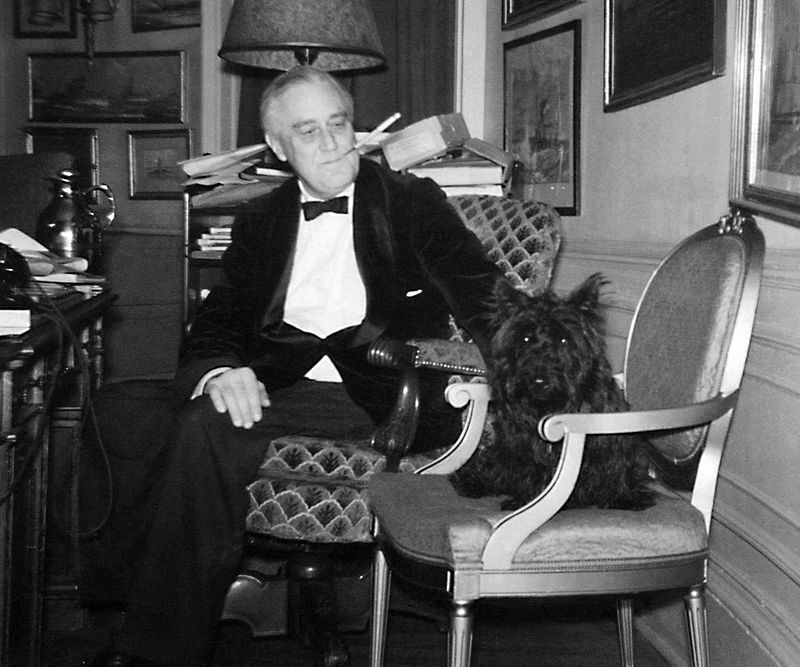 It was so neat to read about the stocking that Mrs. Roosevelt prepared and hung for Fala – the president’s Scotty dog. Fala – whose real name was Murray the Outlaw of Falahill – had lived at the White House since 1940 and was a beloved pet. Shortly after the dog’s arrival, he became very sick, and after a rushed trip to the veterinarian, the cause was found to be begging for too much food in the White House kitchen! After that, Roosevelt ordered that no one else would feed the dog – only the president would have that task. Fala had the run of the White House, so the dog probably spied into the map rooms and wondered at the amount drinks that man from England consumed. During World War II, Fala took trips with President Roosevelt for diplomatic meetings and got to ride in the presidential plane, ship, train, and limo. How many dogs can brag about that? This well-cared, affection dog outlived the president and then stayed with Mrs. Roosevelt. Fala died in 1952 and was buried in a marked grave, not far from the president. Several statues of this pup have been created, including one in Roosevelt’s memorial along The Mall in Washington D.C. Yes, there were still plenty of historical details about the world at war, but I really enjoyed the details about the Christmas tree lighting ceremony and hope Churchill and Roosevelt tried to use the opportunity to encourage and inspire. Really the quotes shared above are wonderful inspiration, I think. I’ve always liked Churchill’s 1941 Christmas speech and it rings true in so many eras. I think about when I was a kid in 2001 – we still had our Christmas fun, even though America was still grieving the 9/11 attacks and getting ready for war. 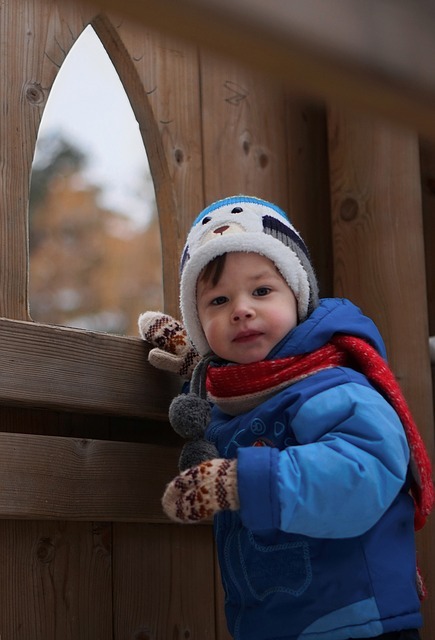 I think about more recent Christmases when tragedies have filled the media; no, the world is not a peaceful place, but let the children have their fun, their holidays, their Christmas. The “grown-ups” will watch the fun, enjoy the moment, and keep fighting and working for their little ones’ safety and futures. And yet we feel inspired by watching the children laughing and playing.